Here's a recap of SIGNA's Newsletter Winter Edition. As you can see from its cover below, Juno irises are featured in detail, and the article crafted by Panayoti Kelaidis from Colorado, is as complete as they come. With well over fifty species in its section, Junos come in all sorts of colors and tones, and with an average height of between 6 and 12 inches. I added Junos to the list of irises I want to grow and learn about. If you have not heard about Juno irises, where they can grow successfully, and most importantly how to grow them, then I hope you get to read this article. 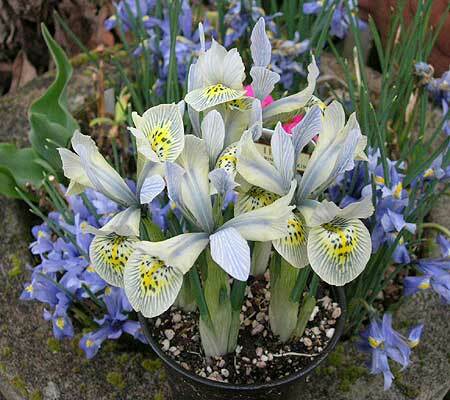 There's also a wonderful update about Iris ruthenica, on the article called Irises from Russia, by Nina Alexeeva. 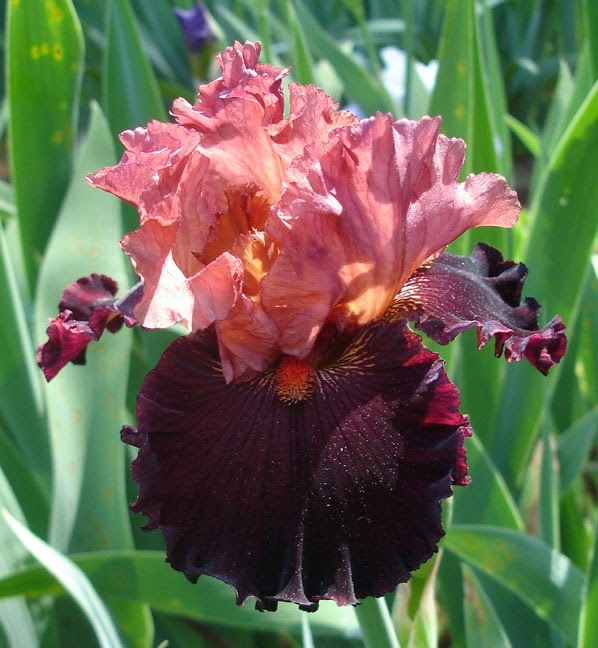 This beautiful medium size iris can be found in nature in Central Europe and Central Asia all the way to Mongolia and China. Despite its large habitat many gardeners in these areas are still learning about the potential of this violaceous beauty. A wonderful read. 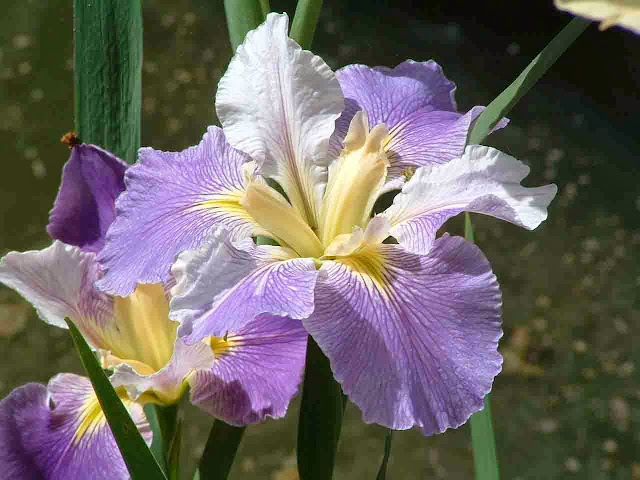 With humor as a sizable and necessary part of the irisarian's experience, our own World of Irises blogger, Griff Crump gives us a great opportunity to laugh about some of the tricky and interesting iris names we may encounter. The article is called: "Humor -- Those Puzzling Iris Names." 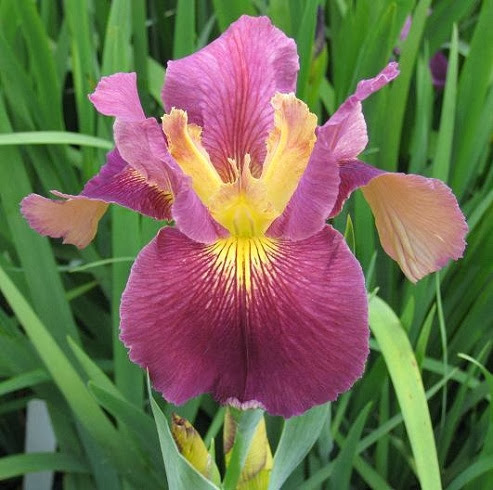 Dennis Kramb gives a detailed report on the Siberian and Species iris Convention held in 2013 that you won't want to miss. 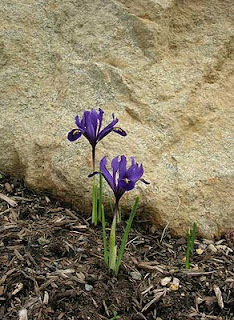 A favorite iris variety that I have yet to grow is covered in detailed on an article with fantastic images to enjoy. I'm talking about beautiful irises dichotoma and domestica, and their child named Iris x norrisii (ex-pardancanda). 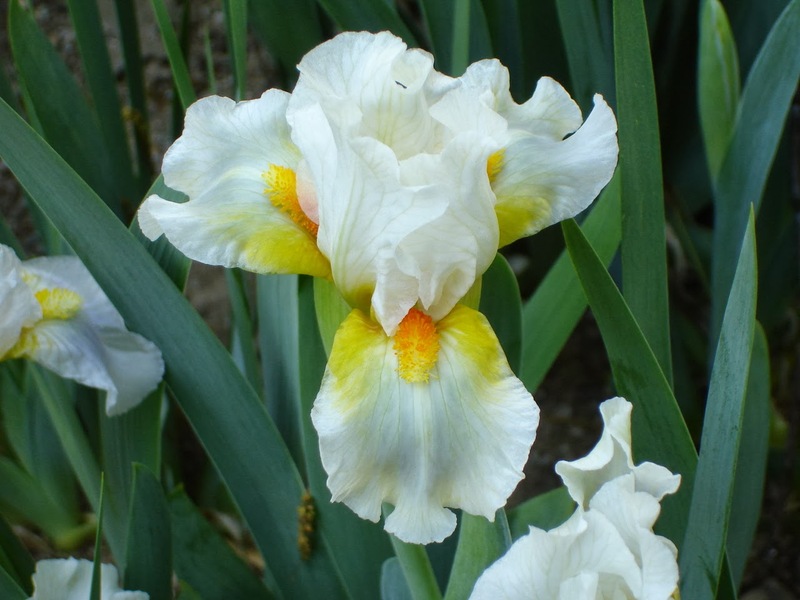 The article is "Identity Crisis" by another of our wonderful World of Irises blogger, experienced iris grower -- and gardener extraordinaire -- Jim Murrain. Lastly, I know SIGNA leaders would want me to mention that the SEED EXCHANGE is ready and open to receive your orders. 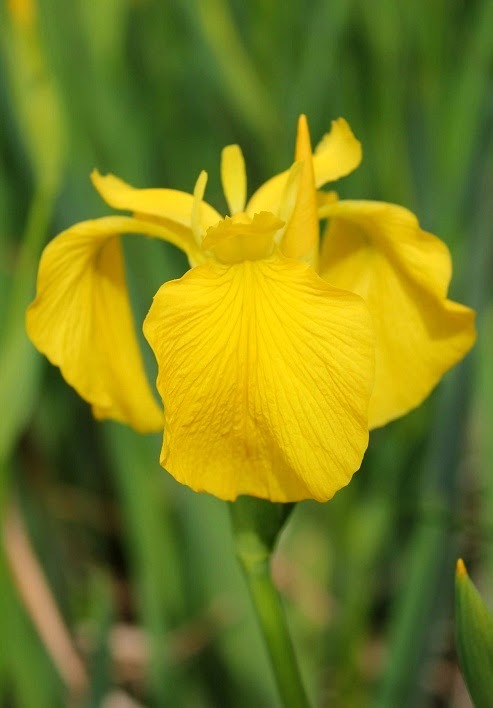 If you don't know about the seed exchange, may I direct your attention to SIGNA's website: http://www.signa.org where you can find more information about obtaining seeds of iris species and other hybrids, and also to browse through a list of iris types available. Although you have to be a SIGNA member to order seeds, you can become a member online at the same time as you order seeds. 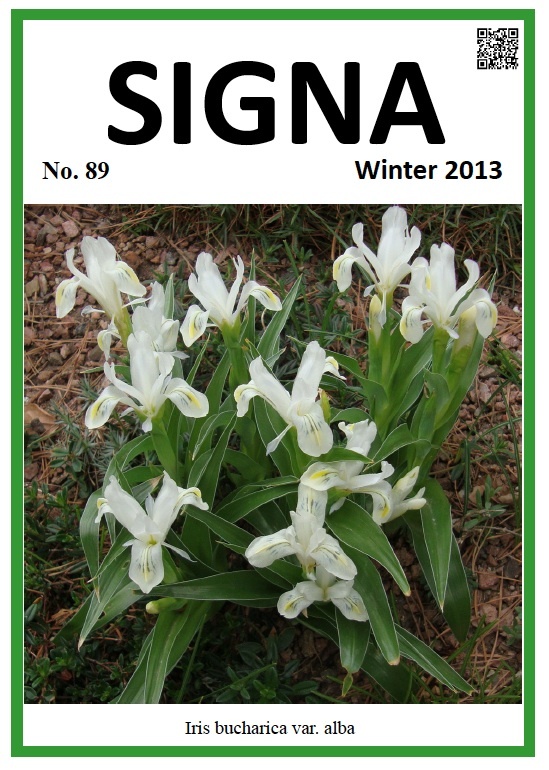 SIGNA newsletters are a pleasure to read, and I hope you too find them a great learning tool while immersing yourself in the world of iris species. 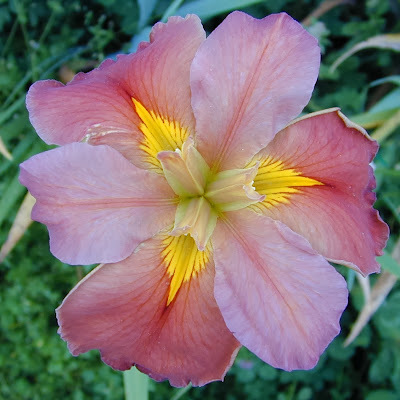 "GLOBAL CROSSING," "GOOD HOPE," "LACY DAY,"
"PURPLE RITZ," "POND LILY," "MARY FRANCIS,"
Since planting my first tall bearded irises in 1995, I have routinely planted the reliable and hardy beauties with a variety of companion plants. Over the years I'd always thought mixed planting was beneficial in more ways than the aesthetic beauty provided to the landscape. 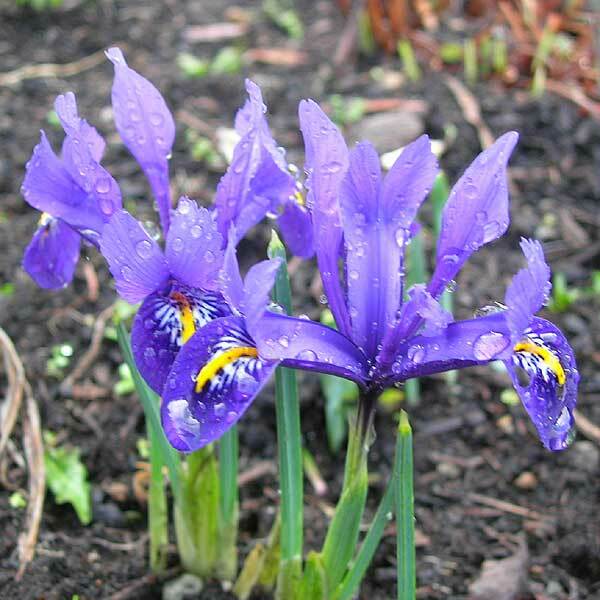 However, some sources had discouraged this practice, some even saying it was detrimental to the irises to plant them closely with other perennials and annuals. Recently, however, two well-known and trusted sources confirm my thoughts about planting a variety of plants with bearded irises in your landscapes. In his comprehensive book "A Guide to Bearded Irises--Cultivating the Rainbow--For Beginners and Enthusiasts," (Timber Press, Inc.) award-winning author, horticulturist and expert on iris Kelly D. Norris tells us that it is a myth that bearded irises "don't play well with others and need to be kept separate from companion plants." 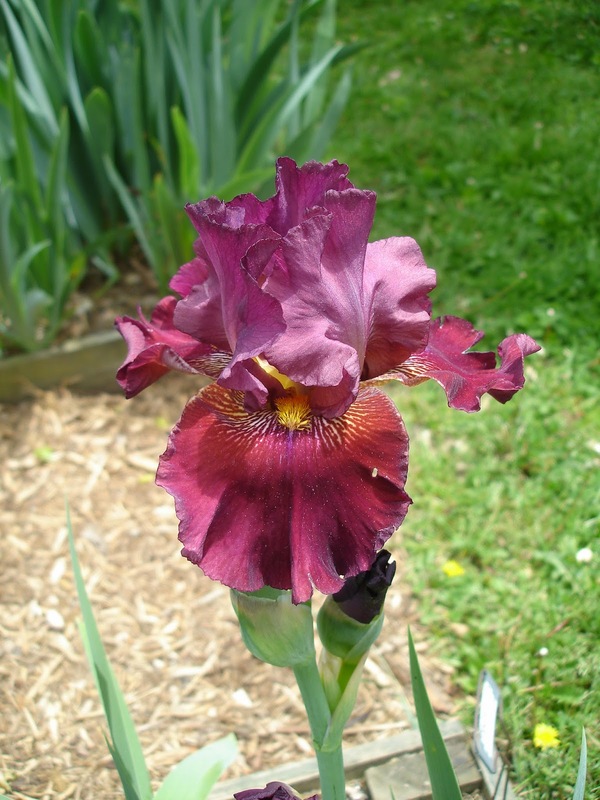 He says problems such as "leaf spot, rot, and brown foliage" are not due to mixed planting, and he encourages us to "use bearded irises to punch up our gardens with color and springtime life." Blooming tall bearded irises "BLACKALICIOUS,"
The Schreiner's Iris Gardens blog "For the Love of Iris--Articles, Tips & Notes," (click to go to their site) tells us that a "centuries-old gardening tradition follows the theory that different plant species, planted close together, can assist each other with nutrient production and absorption, controlling pests, attracting pollinators, and other factors necessary for their full productivity." In the Display Gardens at Schreiner's Iris Gardens, Ray Schreiner designs with these principles in mind. The article goes on to say that "some of his [plant] choices fix nitrogen in the soil, others attract butterflies, others pollinators, some work to control weeds," and, of course, some are "chosen simply for their aesthetic appeal." 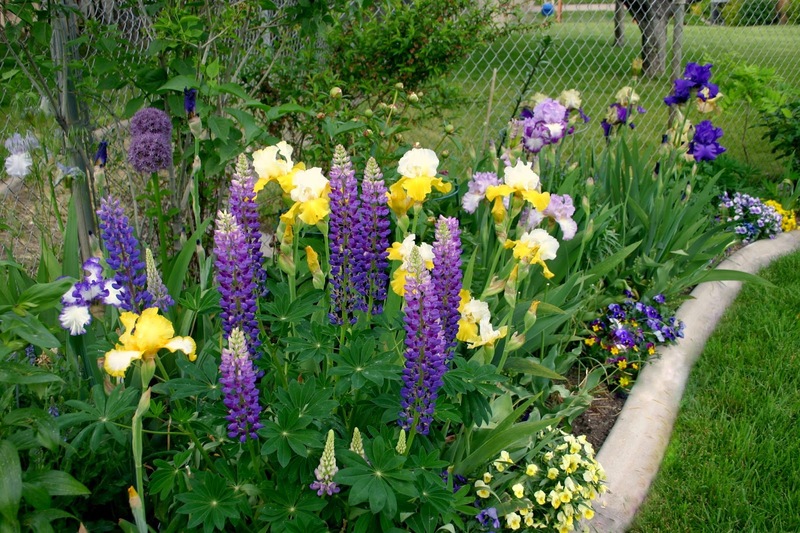 When planning flower beds for your landscape, always keep in mind the growth of the plant. Even when planting close, allow room for them to "breathe" as they mature and reach their maximum size. Because of my space limitations, most established clumps of irises are limited to roughly 10-15 stems. 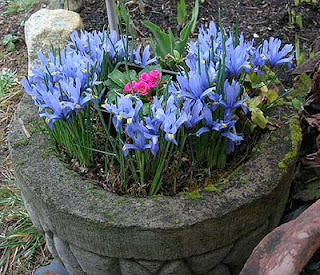 Tall bearded irises "POEM OF ECSTASY,"
"JUMP FOR JOY," and "MASTER TOUCH,"
Be aware that close planting requires careful grooming of perennials in the early spring, and regular fertilizing and care of the soil for maximum success through the season. Choose flowers that provide great interest in height, form, and texture. For best results, use plants that have similar growing conditions and needs. Bloom overlapping keeps your landscape in color throughout the entire growing season; you may need to experiment with different cultivars to ensure the longest bloom time. The blue iris bed: Tall bearded irises "QUEEN'S CIRCLE,"
"PLEDGE ALLEGIANCE," "STAIRWAY TO HEAVEN,"
"VICTORIA FALLS," "PROUD TRADITION," "ALTRUIST,"
Using plants that complement each other with a variety of textures, colors, size and shapes make the landscape more interesting and pleasing to the eye. I've seen many pictures on this site with stunning landscape designs. 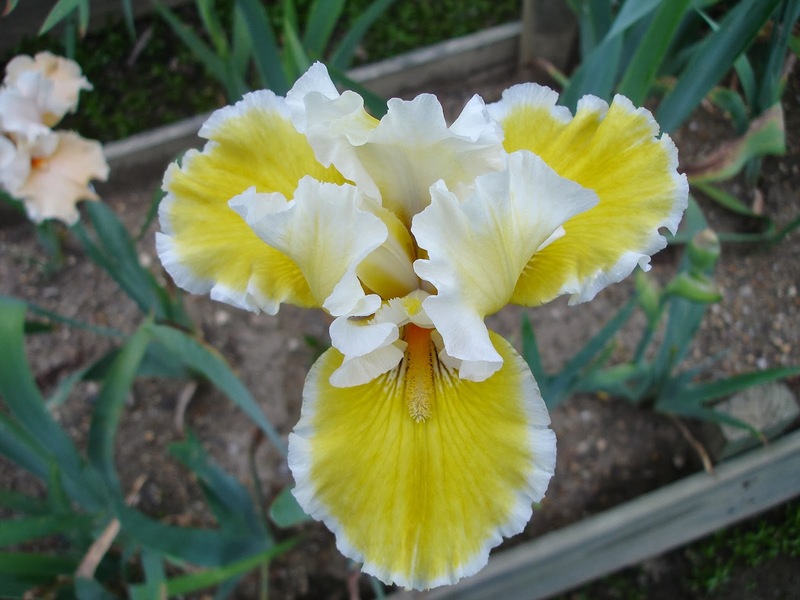 To view these, check on previous articles here at the AIS blog, "World of Irises." 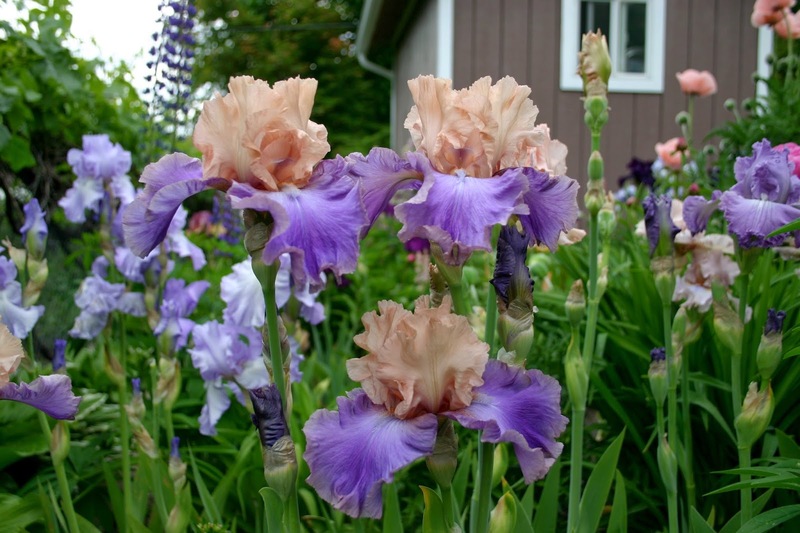 Tall bearded irises "MYSTIC'S MUSE,"
Whether you're a beginner iris-loving gardener or an expert designer, the practice of companion planting in your iris beds will enhance your landscapes and bring a joy that I've found to be most rewarding. 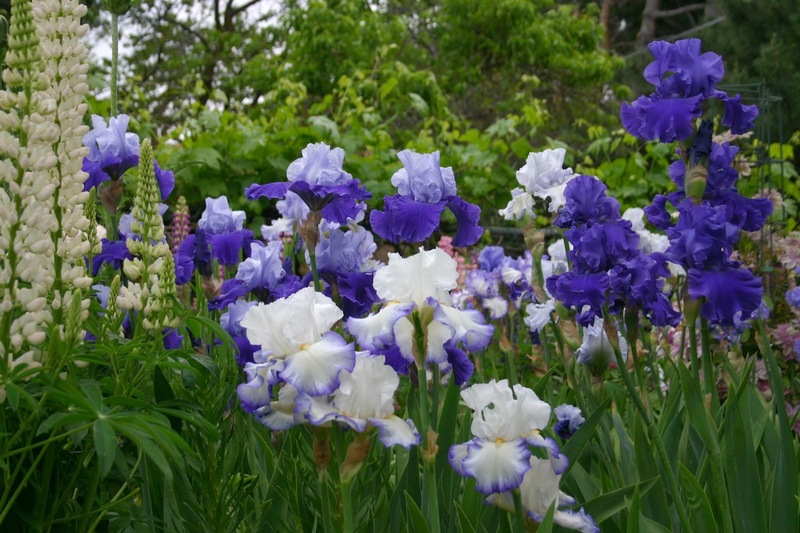 STITCHERY," "SILVER YEARS," "NEUTRON DANCE,"
What different plant species do you have in your landscapes that go well with irises? Iris reticulata is always the first spring bulb to make an appearance in my PNW garden, beating even the snowdrops in bringing a cheerful spot of color. With our cold winters, dry summers and sandy soil these little gems are pretty care free here, making them even more welcome. 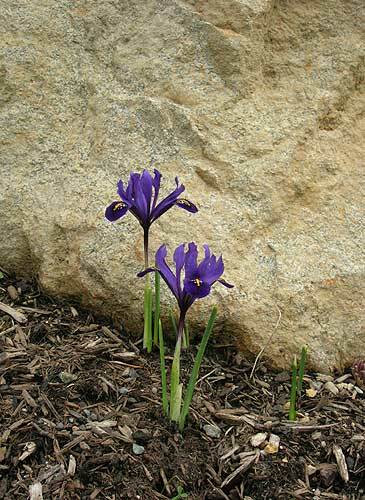 Above: I. reticulata "Katherine Hodgkin"
They are excellent additions to a rock garden but also do well potted. If you live in a climate with wet summers you can always toss their container under cover after the foliage dies back and bring it out again in late autumn. Look for them at your local garden center. Reticulatas are often sold alongside crocus and daffodil bulbs in the autumn. For hybridizers, winter is a time of reflection and anticipation, thinking about progress made toward hybridizing goals, reviewing crosses made and looking forward to as yet unseen blooms come spring. Making their debut this spring will be many irises planted as seeds in 2011 and 2012. Here are some of these crosses along with what I hope to see when they first flower come spring. 2011: Sdlg 952Z1 X Sdlg 082R15: A Black Amoena? Beginning hybridizers are often counseled to "cross the best with the best", and that's good advice. Sometimes, however, other considerations prevail. 952Z1 is more than 15 years old and its flower form is "just" modern, but its bold yellow draws garden visitors over to it time and again. It has excellent branching and unusually heavy substance. 082R15, on the other hand, is a recent development. It, too, draws the visitors. 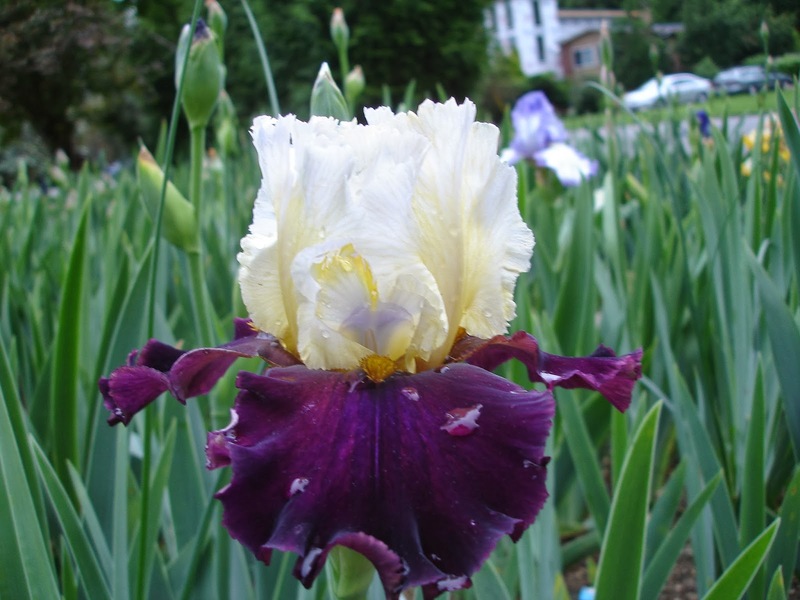 Despite its handsome appearance, however, it's not really a good iris because of the delicacy of its petals and the rangy stalks. So, why make the cross? With 952Z1 as the pod parent, I'm hoping that its strong traits will prevail in some of the seedlings. Long-range target: A black amoena. Shorter range: A yellow/black bi-color. 01S2 is gorgeous, in my not-so-humble opinion, but it and its near-twin, 01S3, inherited the short stature of their pod parent, "Aura Light", and their very large flowers work against symmetry, so they won't be introduced. However, by crossing them with "Lezghinka" as the pod parent--which is very tall and well-branched-- I hope to get the best features of both, including broad, velvety mahogany-red falls. 2012: "Minneola" X Sdlg 082Y1: REDDER! Sdlg 072N6 resulted from a cross of "Wearing Rubies" X Sdlg 01J4, which stemmed from "Romantic Evening", "Champagne Elegance" and "Lady Friend". 072N6 reblooms. So, this is a back-cross, looking to see if I can get more rebloomers with rich reds and velvets. I'm satisfied with "Csardas Princess" as the sturdy, well-branched upright flower that she is, but couldn't help wondering what might happen if I crossed that pretty thing with "Poise Aplenty", which produces 10-12 buds on slender S-curved stems. Unfortunately, the germination rate in 2012 was miserable, but we'll see what the survivors look like, hopefully, this year. Sdlg 082L13 X Sdlg 01S3: SURPRISE! I confess I have no rationale for this cross except to say that I couldn't resist it! "Faerie Court" is one of my earliest registered irises, and I've never known quite what to do with it. The question always in my mind was what could it be matched with that wouldn't overpower that delicate pearly lustre in its falls. Finally, I think I've found the right candidate in "Bright Sprite". "Bright Sprite" has two doses of "Lumalite" in it, which I think may possibly even enhance "Faerie Court's" hues. "Bright Sprite" is a standard dwarf, whereas "Faerie Court" is a slender, mid-sized tall bearded. I'd be delighted to get a good-looking intermediate as a result. So, these are a few ventures whose outcomes I'm looking forward to (apologies to Winston Churchill). I hope to share the results in a future posting. 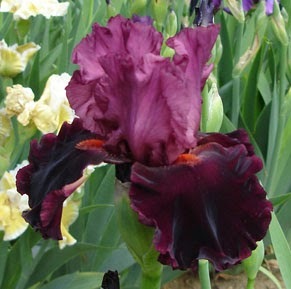 In Part I of this series, we looked at some of my favorite iris pictures. Here is the second part, with more lovely photos of Louisiana irises. Marvin Granger, from south Louisiana, found a "cartwheel" form Louisiana iris growing in the wild and collected some to use in hybridizing. He then crossed this iris and produced several cartwheel form irises. After his death, Jeff Weeks decided to name and introduce one of Marvin's seedlings that Jeff had been growing for many years. "Double Encore" is that lovely iris. Pat O'Connor lives in Metairie, LA, just north of New Orleans. He has hybridized some really nice irises and is quite a photographer. The iris was named for a famous (infamous) lady who wandered around in the French Quarter of New Orleans with a duck in a cage. Bernard Pryor and his wife Heather have produced an abundance of beautiful Louisiana irises from their home in Australia. They are both fantastic photographers and I always enjoy their bloom season pictures since their bloom season falls in the fall here in Louisiana. Another beautiy- well photographed from the Pryors of Australia. 'Flareout' is one of several "cartwheels" produced by Marvin Granger. It is one of my favorites and I though the photographer really captured a great photograph of this blue cartwheel form Louisiana iris. With all the hurricanes in south Louisiana, one might think this iris was named for one of the more famous and destruction ones; however, it was named for Pat's son. Pat says Colin was in fact often a small hurricane! Peter Jackson is another great hybridizer and photographer from "down under". 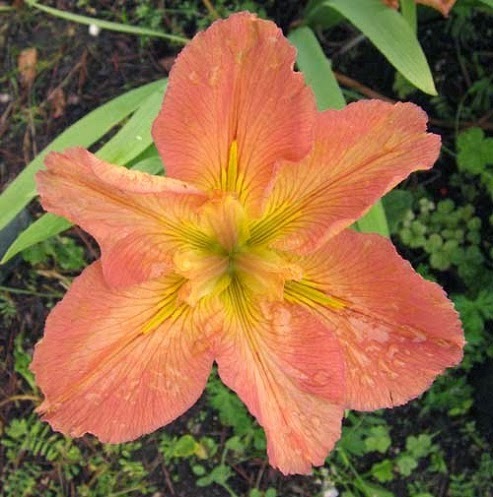 His Australian Louisiana irises are beauties to behold and he is also a great photographer. 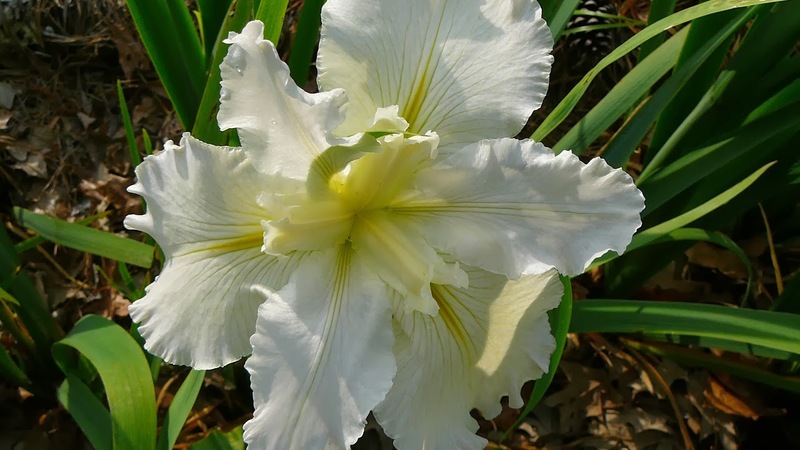 Dormon named this beautiful white iris to honor Longue Vue House and Gardens in New Orleans. 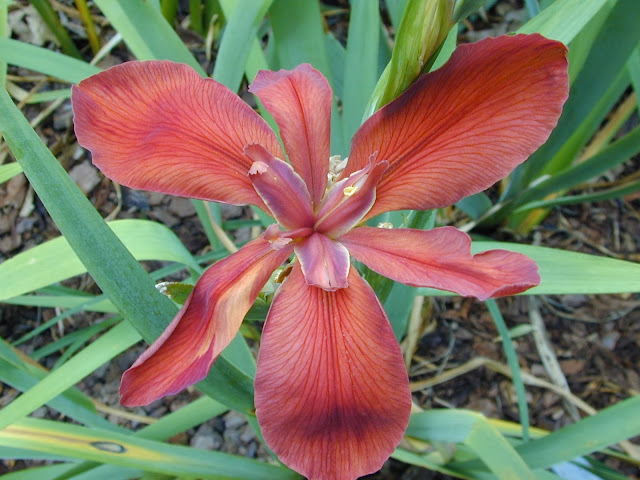 This is a collected species of Louisiana iris and is a rare form mostly found in older hybrids and in the species. It is a lovely iris and this is a great photograph! There are just a few more to go and I'll publish part three of my favorite pictures in the immediate future. Hope you enjoyed the beautiful irises and the great photography. 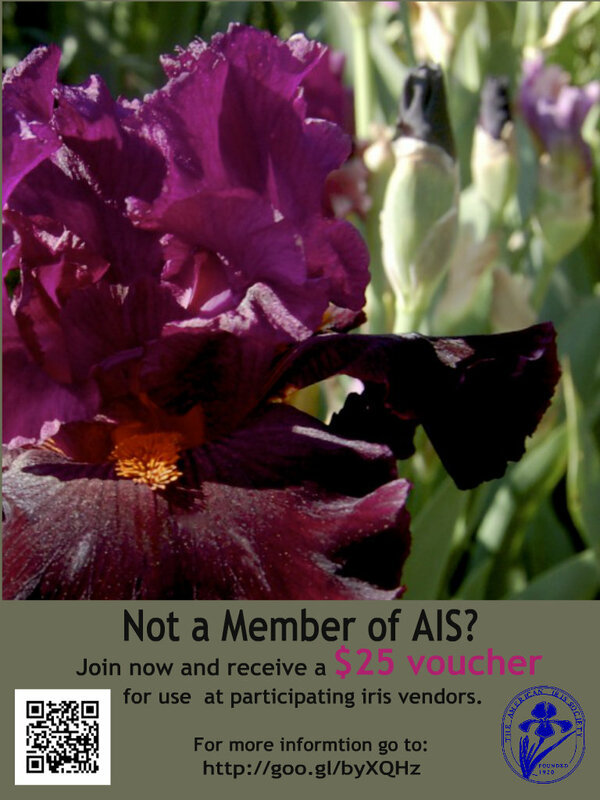 Learn more about irises at The American Iris Society or about Louisiana irises in particular at The Society for Louisiana Irises. Happy New Year friends. I hope that 2014 has treated you kindly so far. As I write this, I've become energized by the thought that there are only 70 days to spring here in the northern hemisphere, at least astronomically. Of course, we all know that spring actually arrives at each location according to its climate and geographical site. Have you ever recorded the signs of spring in your area? Here are a few of the signs that I've noticed where I live: more and more leaves on all plants; green, fresh buds starting to form; more and more bugs flying around, or for sample lady bugs are noticed all over my roses and irises; birds suddenly appear and are singing to their hearts content; and for us, iris lovers, perhaps long stems of potential iris blooms are forming, pointing skyward and getting higher and higher; and in my area, iris bud tips have striking colors contrasting with the green of the leaves. What are the signs of spring in your area? We're getting there very shortly. Yes, we are. Your membership is very much valued by all of us, as it directly helps to disseminate the goals and values of the organization. Thank you for your help, and please tell your friends and family. [Iris clubs and affiliated societies are welcome to use the ad above in your own individual newsletters]. 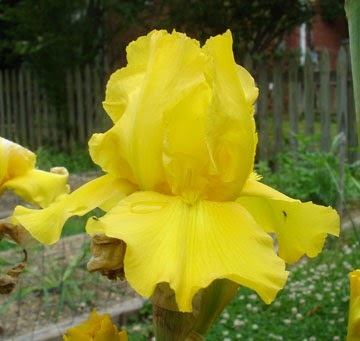 I receive many pictures of Louisiana Irises submitted on the internet by members of The Society for Louisiana Irises (SLI) during bloom season. I save the pictures and often spend time looking back at them during the cold winter months when nothing is blooming. 'Barbara Elaine Taylor' is an example of an "oldie but goodie" that continues to put on a show in the garden. 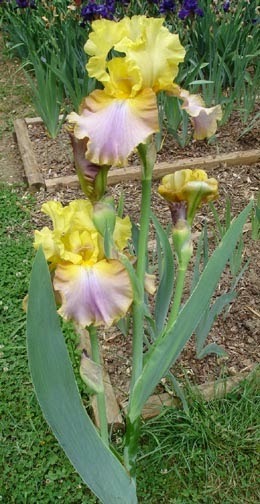 The older more open form with stands that stand up is one of my favorite forms within the Louisiana irises. 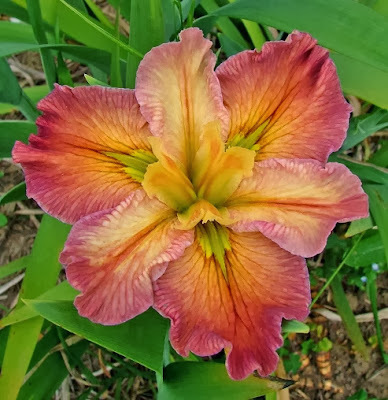 Jeff Weeks hybridized this wonderful iris with some unique coloring. 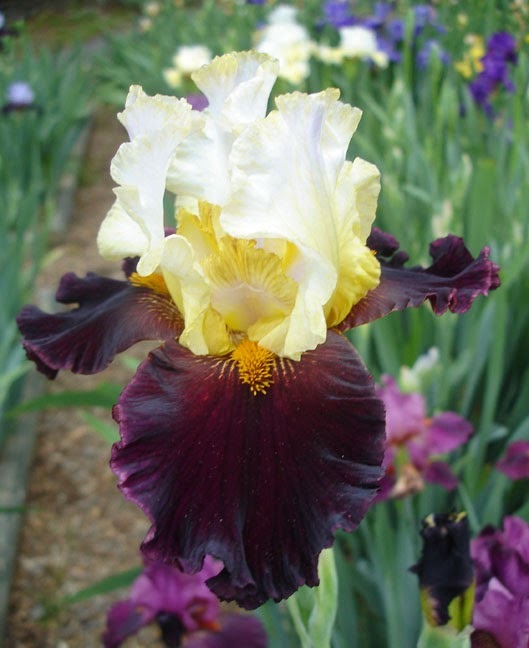 It too is one of the older forms of Louisiana irises that continues to be popular. The pollen parent is 'Wheelhorse' (Caroline Dormon, 1952) and you can see this new hybrid inherited the form from the pollen parent, where the petals look like a wheel. 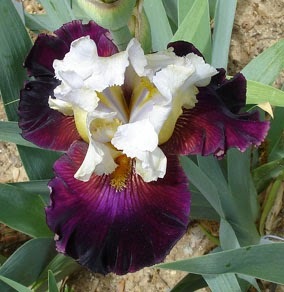 Although I have never viewed this iris in person, I have seen quite a few pictures of this lovely spidery form iris. It has a very nice reddish color with some darker veining. It looks very much like some of the species Louisiana irises and I just love this form. A beautiful Louisiana iris with a Louisiana name, produced by the Regional Vice President elect of Region 10 of The American Iris Society, Joe Musacchia. Joe actually lives south of New Orleans and is about as far south as you can go without driving into the Gulf of Mexico! There is a shortage of pink irises in my opinion. Although registered as white, "Birthday Suit" shows a lot of pink. 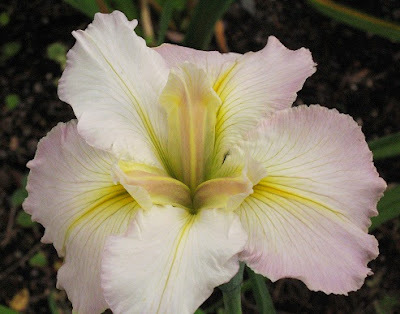 Pat O'Connor lives just north of New Orleans and has introduced many beautiful irises. 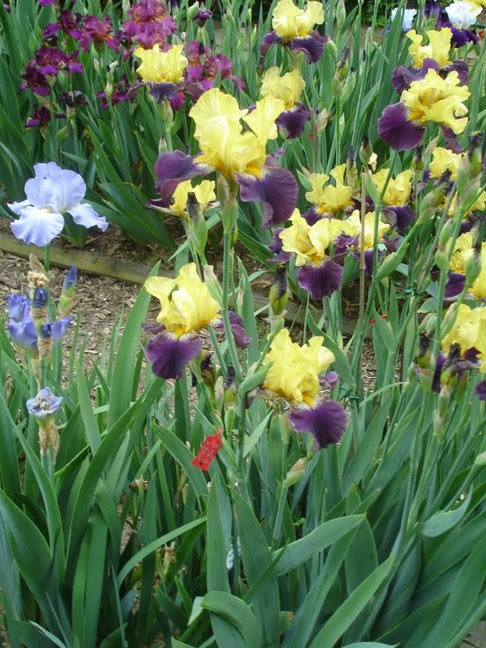 Mary Dunn produced hundreds of beautiful irises. This is registered as "ecru mauve" but, it looks pinkish to me. It is a beautiful iris with a distinctive red outline around the signal. I do not know Mr. Anfosso nor do I know which SLI member took this picture (please let me know so I can give you credit!) but it is certainly a beautiful example of some fine photography. Stands that stand up and falls that fall down are rare in modern day hybrid Louisiana irises. Dormon Haymon, from Lafayette, LA, hybridized many beauties and this is certainly one of them. I really like the serrated edges with the slight white halo. You have to love the way the stands stand up so tall and the falls fall down and curve under. This is a very tall iris and can be seen in the garden from quite a distance. 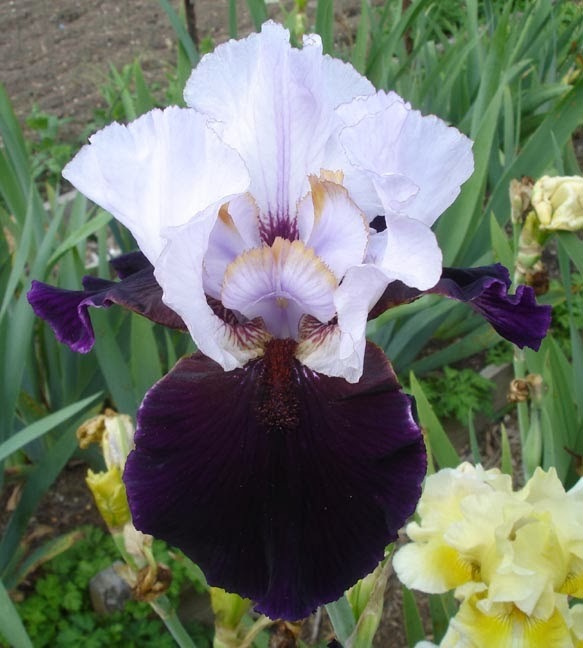 I could not find any registration information concerning this iris. It could be still hanging around on a "garden" name. Regardless, there are few Louisiana irises that have this form in which all the petals fall down and leave the style arms standing up. If anyone knows more about it, please comment below. Next time we will look at more beautiful irises that are nicely photographed. 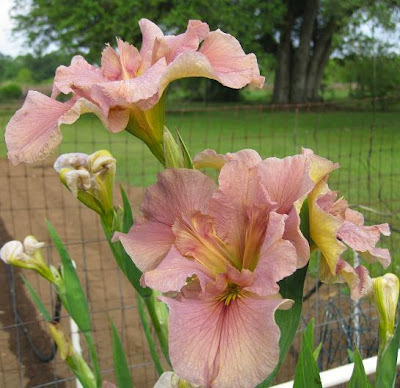 Until then, you can learn more about Louisiana irises at The Society for Louisiana Irises or irises in general at The American Iris Society.